It’s that time of year again when the sun comes out for 2 hours in the middle of the day, and you are briefly reminded of what warm weather feels like. Grass is visible for the first time in almost 3 months in some parts. The majority of us have not swung a golf club in five months, and we are getting eager to get on the course. Well, I’m here to update you that you’re going to have to wait just a little longer. 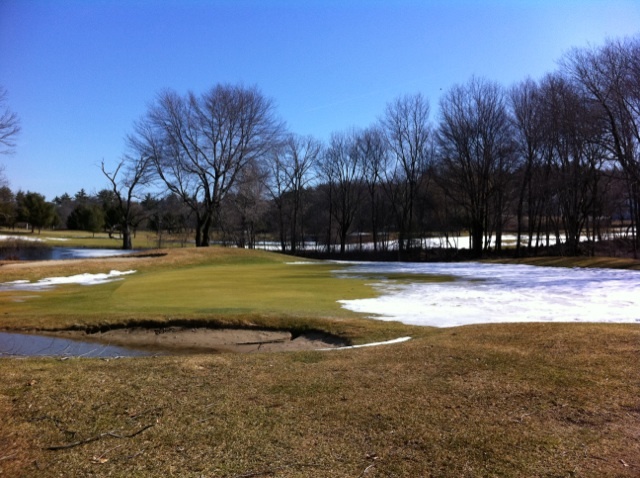 After walking the golf courses pretty extensively on Monday and Tuesday of this week, approximately 35% of the course still remains covered in snow. Yes, I know fairways 1, 9, 8 South and 1, 9 North look great from the road. And maybe you have noticed the practice greens are even clear when you came in to pick up your re-gripped irons. But, unfortunately 65+” of snow takes a little longer to melt than your average snowfall in an average winter. What’s my prediction? I can’t give a date. But it will definitely be before the end of the month. I am happy to report that, even though we had record-breaking snowfall this winter, nature was pretty good to us. There is minimal debris on the course, and minimal gray snow mold formation in some fairways and roughs. The turf looks extremely healthy. And, unlike last March, there is minimal flooding on the North course. 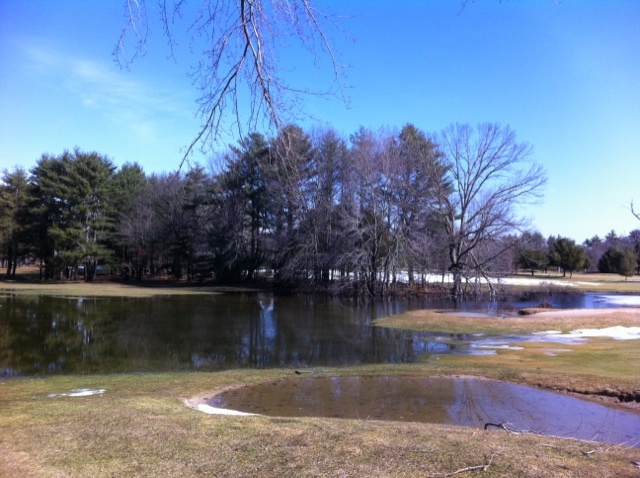 The usual overflowing pond on 17 North causing a pond near 2 tee and a stream running across 1 fairway are the only excess water areas on the property. These pictures below are probably the worst of the mess from the winter. This is all very uplifting news because once we can get maintenance vehicles on the course, the cleanup will be pretty quick. Check back often, as I will try to give a regular update as to when we will be opening! See you on the course soon!